This site is the result of my desire to learn more about my Great Grandfather: a Civil War Veteran, College Professor, Latin Scholar, Librarian, Farmer, and Real Estate Developer in early Los Angeles. He served as President of the Rosedale Cemetery Association, the Long Beach Land and Water Company and the California Chautauqua Assembly. I acknowledge with thanks the many researchers who have helped me compile this information and I welcome any comments, corrections or additional information on my research. This information is correct to the best of my knowledge. If you cite any of this information, please credit this site. Thank you. 1.Article. 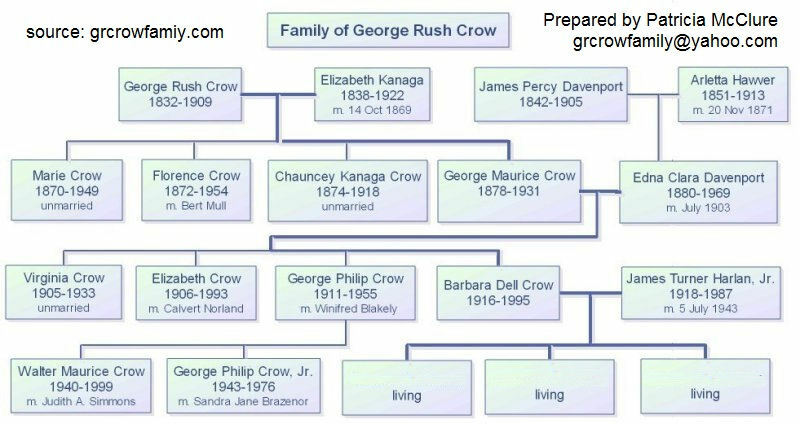 Crow Genealogy Compiled after Years of Research. The Genealogical Helper. v. 12, no. 6. Marriage record. Shawnee Co., KS. Topeka Gen. Soc., 1982. Vol. I, p. 27. 10. Cemetery record. Section I Rosedale Cemetery, Los Angeles, California. 12. Death certificate. George Maurice Crow. California. Los Angeles Co. #11143 dtd 9 Oct. 1931. 13. Death certificate. Elizabeth Morris Crow. California. Los Angeles Co #3448 17 Apr 1922. 14. Census. 1860. Champaign Co, Urbana Twp., OH. pp. 121-123 5-7 July 1860. 15. Obituary. Marie Frances Crowe. Los Angeles Times, 29 Jan. 1949, p.8. Times, 24 Aug. 1898, p.14. 20. Newspaper. “Marriages Licenses.” Los Angeles Times 3 July 1903, p. 12. 21. Newspaper. “Notes and Personals.” Los Angeles Times 26 July 1903. 22. Obituary. 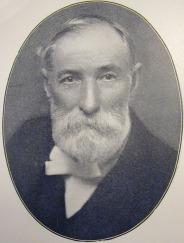 Dr. G. Maurice Crow. Los Angeles Times. 8 Oct. 1931, p20. 23. Book. Who's Who in the Pacific Southwest: Los Angeles: Times-Mirror Printing House, 1913.